Gear up for a thrilling adventure to recover a legendary flying machine buried deep in the ruins of an ancient desert city. You'll need to coordinate with your teammates and use every available resource if you hope to survive the scorching heat and relentless sandstorm. 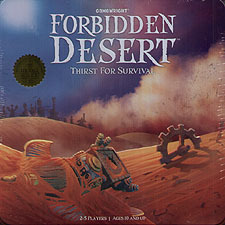 Find the flying machine and escape before you all become permanent artifacts of the forbidden desert. A follow up to Forbidden Island this time with a bit more going on within the game. I really liked this and I certainly prefer it to the previous game as I felt that a little too light. This one is still light but there is a lot more going on and does provide a focus for the players to be running around the desert in the form of collecting parts to restore an ancient flying machine to escape death. Everything works well together and does provide tension and encourage team work to escape your collective fates. Great game, would definitely play again and the components are of excellent quality.